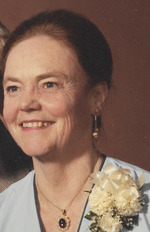 Isabel Margaret Hobson (née Clay) passed away peacefully on Sat. March 9, 2019, at the age of 94. Predeceased by her husband of 54 years, John Peter Hobson; grandson Peter James; brother John and wife Ruth; sister Katharine and husband Ted Hutton. Survived by brother-in-law Winslow Hobson and wife Shirley. Loving mother and tireless supporter of her four sons Daniel (Jane); Eric (Susan); James (Anne); and Alan. Survived by grandchildren Michael and Taryn, Laura and Shannon (mother Diane), David and Sarah. Remembered fondly by many nieces, nephews, cousins and friends. Isabel was born in a small farm house in Slocan, B.C. on Oct. 6, 1924 to John Owen Clay and Selina Margaret (Martin). Childhood companions included her Martin cousins, Patricia (McKenzie) and Joanna (Miller). A vigorous and energetic woman, she was coach of the University of British Columbia field hockey team. In 1948, she earned a BSc in Physical Education from McGill, where she was class president and won a gold medal for academic excellence. On graduation, she married Peter Hobson in Victoria, having met him a few years earlier at a tea hosted by the local ornithological society (bird watching). A portion of her early married years were spent in Berkeley, CA where Peter earned his Ph.D. and sons Daniel and Eric were born. The family moved to Ottawa in 1954. In 1958, fraternal twin boys, Jim and Alan, arrived. Throughout her children’s formative years, Isabel was the cornerstone of the household, organizing events and outings and shepherding the boys through numerous school, sports and extracurricular activities. At 51, she re-entered the workforce at the then Department of Health and Welfare and spent 15 years as an executive-assistant. Isabel was a very social person, loved entertaining and relished time with family and friends. She held strong convictions, particularly for peace, nuclear disarmament and the banning of landmines. For two years she was president of Ploughshares Ottawa. She loved the arts. A strong swimmer and elegant dancer, she also enjoyed tennis and skiing. And, she was resilient, surviving and recovering from two open brain surgeries in her later years. An avid supporter of the Terry Fox Run and member of the RA gym into her late 70s, she ran her last 10 kms at 79. Her passion, energy, fiercely strong will, and love and commitment to her family were her hallmarks. Deep appreciation to the staff at Ottawa’s Colonel By Retirement Residence, who provided 15 years of outstanding care and became Isabel’s second extended family. Special thanks to long-time family friend and caregiver, Lynn Thompson, and especially to son Jim and his wife Anne Taillon Hobson for their years of stalwart dedication, commitment and enduring love. Donations to the charity of your choice, Ploughshares Ottawa or Canada Without Poverty.